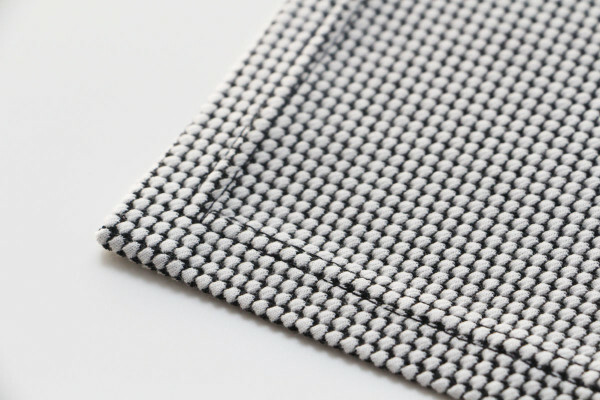 I know that hemming knits can seem a bit daunting – especially when you’re working with an unusual hem like on Axel V1 with it’s handkerchief hem. The good news is, it’s actually really simple! There are a few tricks and then it’s smooth sailing. 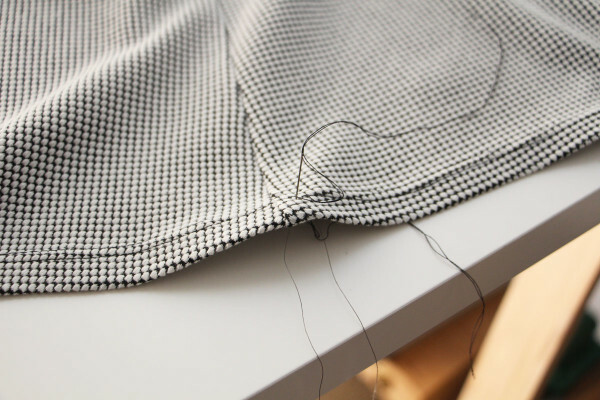 This method works really well for all of the Axel variations, but honestly, will help you hemming any knit pattern whether it’s a tshirt, a dress or a skirt. You’ll never be afraid of knit hems again, i promise! Ready to get to it? 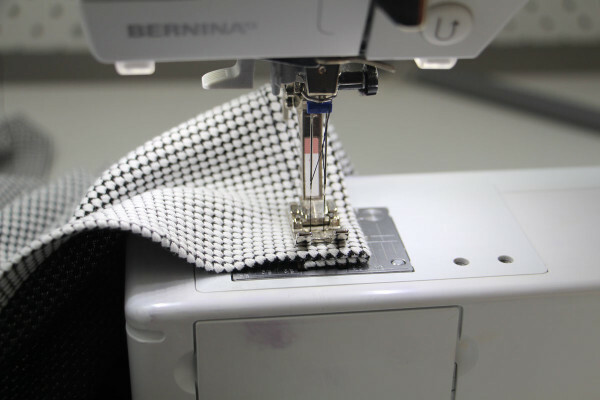 You’ll need fusible hemming tape such as Stitch Witchery or Steam a Seam – you can find these kinds of products in any sewing store, and you want to have them in your kit. They are awesome and once you try a fusible hemming tape you are going to want to use it for everything. I like 1/2″ wide for most knit hems and 1/4″ wide for knit necklines or more delicate hems. Warm up your iron – you knew i was going to say that right? I always tell you to iron, and this time is no different, crack it out babes! You also need to finish constructing the entire Axel V1 skirt as per the pattern instructions (except the hem, because i’m going to show you that now hehe). 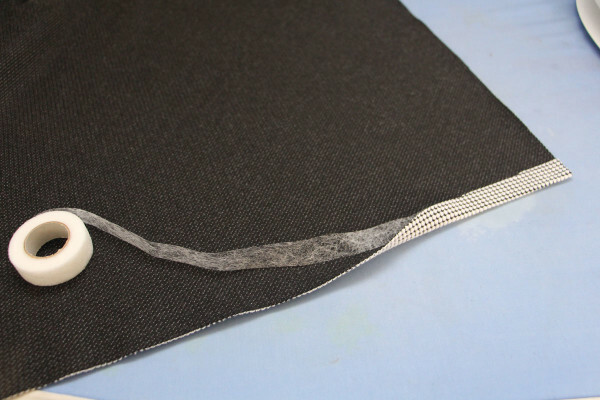 Unroll your hemming tape and starting at one corner of the handkerchief hem, place the hemming tape along the edge of the wrong side of the fabric. 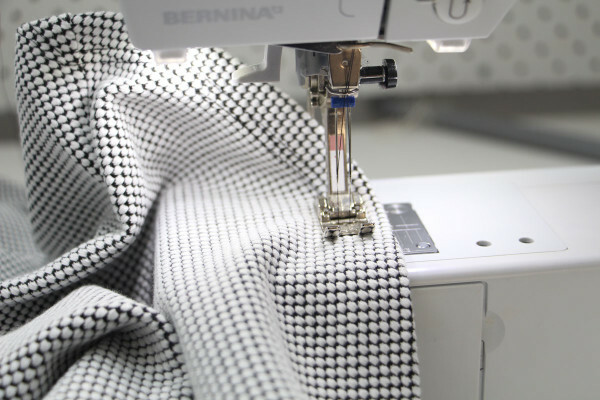 Fold over the hemline by 1/2″ (i’m using 1/2″ hemming tape which makes it easy to keep track of this) and using your iron, press well for a few seconds until the hem is secured. 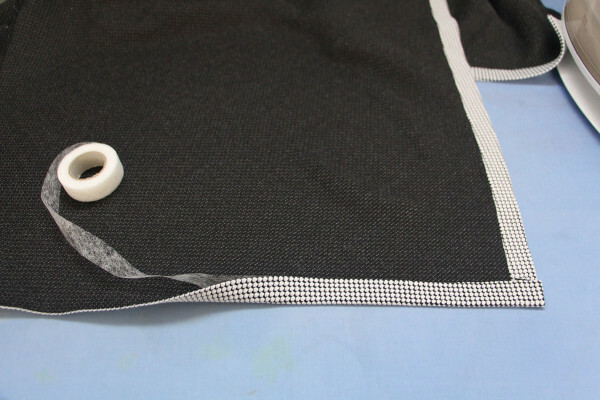 Do not iron back and forth and stretch out or warp the fabric, you want to press by placing your iron directly up and down on the fabric and leaving it there for a few seconds. 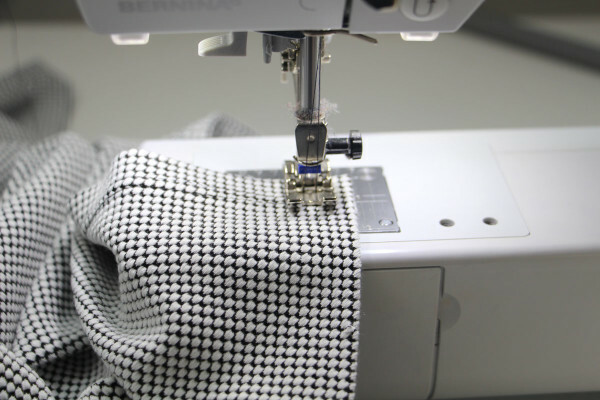 Continue with this method all the way until you reach the next corner of the handkerchief hem. When it comes to doing turning the corner we will use the exact same method as above. 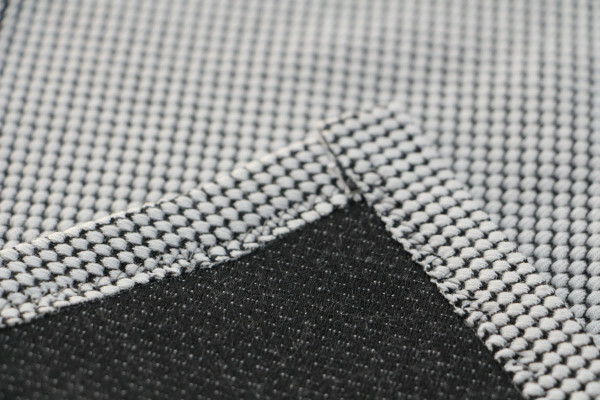 Just be careful that your corner fold is neat enough that the folded edge doesn’t peek out front of the garment. 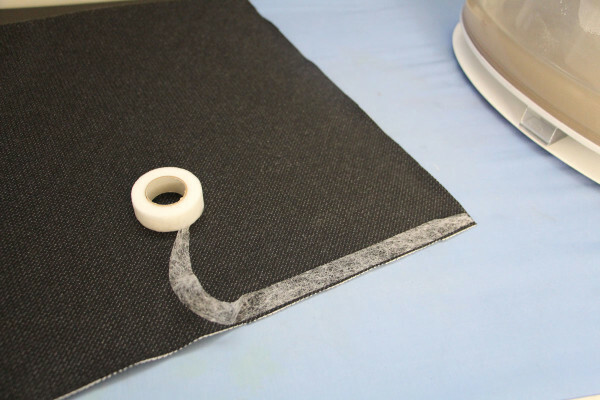 Once you have used fusible hemming tape to turn up the entire hem by 1/2″, then it’s time to sew! You can use a zig zag stitch or a twin needle – i prefer a twin needle. Don’t forget that when sewing with a twin needle you always need to sew on the right side of the fabric! Sew along the hemline so that the left most needle is 1/2″ from the folded edge, this will ensure that the back side of the twin needle stitch (which looks like a zig zag) catches the raw edge of the fabric. Keep in mind that you can backstitch with a twin needle, but in my experience i’ve found that it doesn’t look very neat over time and can unravel easier. So leave your threads loose and i’ll show you how to tie them off later. When you reach the corner you can’t leave your needle in and pivot as you would usually since there are two needles. So with your needles in their highest position, lift up your presser foot,and careful pivot the fabric. Try not to yank it too much and careful place it so that the next stitches start on your just completed ones. 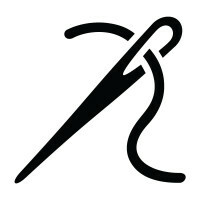 Once you have finished sewing all the way around your hem leave your threads loose and don’t backstitch. Bring the top spool threads through to the wrong side of the fabric with a handsewing needle, then knot off all the threads together on the wrong side of the fabric. Trim the excess thread. Press your hem again, and you’re done! 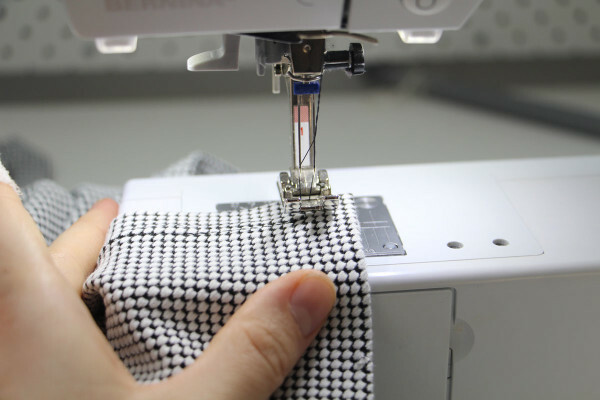 I really hope you enjoy this method for sewing a handkerchief hem on knits! Not only does it make the sewing process much neater and go more smoothly, but i love that it adds some structure to the hemline. 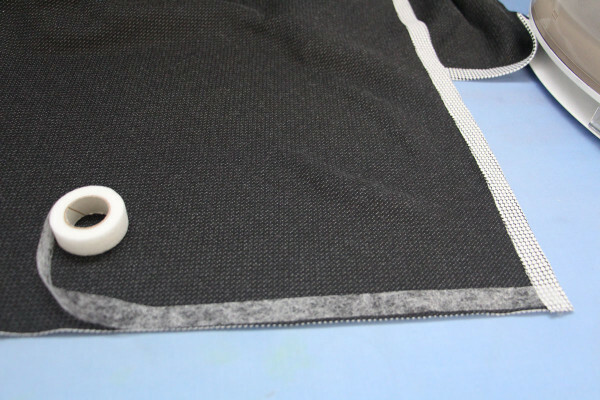 You can use this method on all versions of the Axel skirt, and on any knit pattern requiring a folded over hem. If you’re feeling a bit lazy though (we all do sometimes!) don’t forget that since knit fabrics don’t fray you can often get away without hemming them. I’ve done this on quite a few of my Axel skirts and i’ve been really happy! This is so helpful. Thank you! I’ve wondered how to use that hem tape. Looks super easy. I’ll have to try it soon. I have just finished my third Axel skirt and the fit is great and although I didn’t use hemming tape I am going out to buy some today.